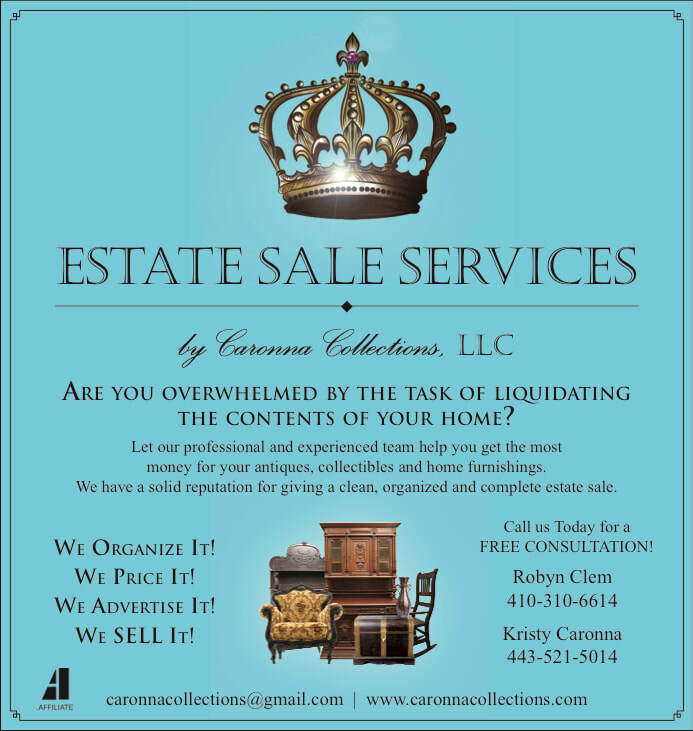 ​​ Estate Sales by Caronna Collections, LLC has a PASSION for this industry. We LOVE what we do and it shows. Marketing and advertising are KEY to a great sale. Caronna Collections, LLC brings an element to our sales and marketing that is unique to us as a company. Typically if you are looking to liquidate an entire household you will have enough items to warrant a full 2 to 3 day estate sale. Average household being a minimum of 3 / 4 bedrooms, living area, kitchen etc. However despite the size of the house, all sales are different. If we aren't able to do a sale — we can give you different paths to handle moving the items. These items should be a good mix of everyday household items (small appliances, electronics, cleaning supplies, books, clothes etc), furniture, tools or yard items, decorator items (mirrors, candlesticks, artwork), table and bed linens, kitchenware, collector items or antiques. You may also set reserves on larger items, or items that have high value. Each estate is different – Caronna Collections, LLC markets each sale according to what is available – from antiques, to books to everyday items. There’s always something you have to sell that someone else will want to add to their collection. Running a successful estate sale can quickly turn into a full-time job. For most families it is hard to juggle and find the necessary time to devote to the project. Pricing, organizing, research, set-up, marketing the event, working the event(and finding enough volunteers to help), bartering with buyers, and final clean up is not only time consuming but can also be mentally exhausting for family members trying to stage their own sale. How do you know which items are worth what? How will you guarantee a good turn out to your sale? What happens when your 2-3 week project has suddenly turned into months? By hiring Caronna Collections LLC it’s as easy as handing over the key and letting us do the work. We have this business down to a science. We know how to price accordingly and research items quickly. We have an extensive list of buyers and dealers and our extensive advertising and marketing always insures a good crowd. We take the stress off you and turn what would have been a few months long project into 2-3 weeks tops. Factor in how much your time (and sanity) is worth to you and we think you’ll find that our commission rate is well worth the service! We ask that any medications (including vitamins) be disposed of properly (i.e. taking to a pharmacy). Discard any papers, trash, etc. Personal papers and information must be gone. Whatever is left post sale — you can choose a direction of donation. Actually this is quite common. Even in cases where the family has thoroughly gone through the house, by the time we clean out every drawer, closet cabinet etc it is inevitable that we will find something. No worries though, we box all of these items up for you and either make arrangements for you to pick them up or ship them to you if you are out of area. The average estate sale is a 2 to 3 day event. Usually a / Friday / Saturday / Sunday sale. We will extend into extra days if need be. Prior to the sale we need on average 1 to 2 weeks to prepare the house, price all the items, market the sale etc. Because each house is different this is a hard question to answer. Upon our initial consultation we will try and provide you with a baseline figure. Please keep in mind though this could change if we discover new items while preparing the sale or if items are removed from the sale. 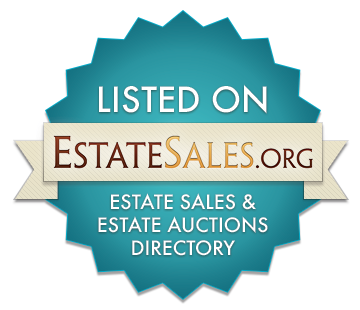 99% of the time we are able to sell 90% of the estates salable items. The remaining items are items that usually should go to donation. If anything of value is left after the sale we can either consign or offer an estate buy-out for remaining items. People sometimes misunderstand how an estate sale works. An estate sale is a liquidation — it’s not a storefront where things might sit for a year or two before selling. The same principle applies to things that are sent to consignment shops — which may think it will sell at a higher price — not necessarily — it may or may not — and may take a year or so before it does. Prices are adjusted daily so that you are not left with half or more of what you started with. Some estate sale companies ‘over price’ to begin with and turn people away with such tactics. Things are only worth what someone else is willing to pay for them. Yes, Our job is to liquidate the house of its assets and provide you with as close to an empty house as possible. We can offer a complete clean out after we conduct your estate sale so the home is left broom swept and ready to move in. Anything left over after the sale is your choice on donations or other options. Estate sales are YEAR ROUND. Time or weather is NOT a factor. An appraisal is a different service than an estate sale. Caronna Collections LLC will do an appraisal for a fee — however this is not generally something that is done when you hire an estate sale company. We are there to liquidate/sell all items you have deemed go for the sale. Appraised values are for insurance purposes only. How is Caronna Collections, LLC paid/ what is your fee? We are paid on commission only. It is in our best interest to insure you have a successful sale! At the end of the sale our commission is deducted from the proceeds of the sale. No upfront fee’s, no minimum guarantees. We work hard and know that referrals can only be earned.